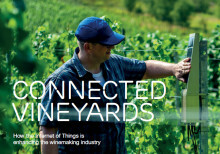 Ericsson, MyOmega, Intel and Telenor Connexion bring efficiency to winemakers with new TracoVino Internet of Things (IoT) solution. Telit and Telenor Connexion collaborate with Allianz Telematics to optimise the mobile networks’ usage according to the guidelines of the GSM Association (GSMA). Ericsson and SAP have success with Telenor Connexion, enhancing business processes and offering a complete end-to-end solution for large enterprises. Together the three companies are making it simple for enterprises to connect their assets and transform their businesses.